2 by 3 Heroes: What's going on here? What is the hell is going on in this picture? 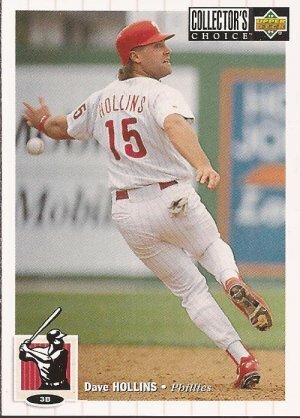 Hollins looks like he saw a ghost, looking over his right shoulder at whatever scared him, but it appears the ball is about to, or already has, hit him in the left forearm. It's a spring training game, but for the life of me I cannot figure out what is happening in this play. I do like the old Howard Johnson billboard cameo in the background, though. Maybe he was looking back to see if the batter was going to make it to first base, and maybe the ball didn't hit him as he dodged the throw to first. He also has no glove. My guess is he's caught in a run-down.